Let it be…said that this reviewer does stray out of their comfort zone occasionally. Children murdered by the mother? Check. Libertarian ethics of avatar paedophilia? Check. An absurdist Bolivian redux of Hamlet? Check. An evening at the Garrick Theatre spent listening to faithful renditions of songs by the most influential band of all time? Well, there is a first time for everything. Many people hate on jukebox musicals but this reviewer does have time for the concept; Buddy, Mamma Mia and Our House all prove that given care and attention, and a back catalogue that can sustain a two hour plundering, it doesn’t have to be an excruciatingly painful evening. Indeed in my opinion the general terribleness of We Will Rock You says more about the quality of Queen’s songbook than it does about the show itself – and the fact that listening to 120 minutes of overblown bombast is more than enough for most people. 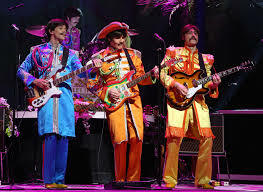 Well, no-one is going to claim that The Beatles don’t have the quality to cover the running time of a tribute concert. Indeed quite a fun little game to play on the tube ride home is to come up with a playlist that is just as strong as the one they left in – Oh Darling, I Want You, Nowhere Man, You’ve Got To Hide Your Love Away, She’s Leaving Home, Dear Prudence & Helter Skelter are just some I would have tried to slot in somewhere. Perhaps it is already a well-known fact but Let It Be is not a musical in any meaningful sense of the word. This is a full blown ‘evening with The Beatles’ affair (except, rather excruciatingly and presumably for copyright reasons, they seem to be called ‘Let It Be’ which does dull some of the mystique). There is no semblance of plot excepting an intermittent narrator guiding the audience through the years and ticking off all the big non-controversial Beatles milestones. Invading America? Yes. Bigger than Jesus? No. Hippies? Yes. Any overt references to mind-splitting amounts of acid? No. Gently mocking Ringo? Yes. Any mention of Yoko Ono? No. Really though none of this matters. The producers have drilled to the core of what people want. And that is for those who never got to hear The Beatles the first time round, it is a chance to hear entirely competent covers of classic songs. And that is what you get – a relentless tidal wave of hit-after-hit performed with verve and energy. The music is so good that you cannot help but tap your toes, clap along and join the gustily sung, surprisingly tuneful audience-led rendition of Yesterday. ← Where are your god’s now?